Are you letting time keep you from making home-cooked, healthy meals? The NutriSlicer may be the solution. The NutriSlicer is supposed to make your meals 18 times faster than normal. How? According to the infomercial, it slices, chops and grates right into your dish. The claim is it is faster and easier than using all the tools in your kitchen. It seems pretty simple to use! First, choose one of the three blades: the slicing blade, chopping blade or grating blade. Attach the handle and lock the unit in place. We used all three blades on tomatoes, onions, and a block of mozzarella cheese. Right away, I loved the NutriSlicer for the way it sliced, chopped and grated the cheese. But everything went downhill from there. Next on my ingredient list were onions. The chute is too small for a whole onion, so I cut it in half. For the slicer, the onions didn’t turn out bad. But it didn’t make the cut for the chopping and grating blade -- we got more of a minced juice. As for the tomatoes, it seemed to be simply squish them, and we tested all three blades. 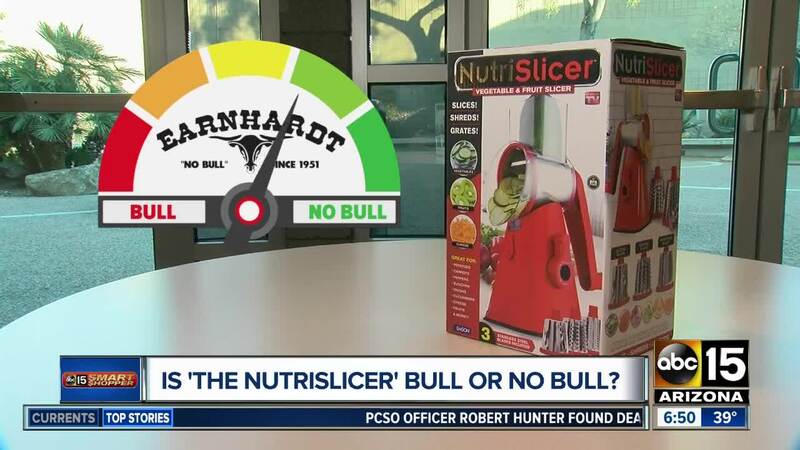 So how does the NutriSlicer rate on our Bull, No Bull meter? Although all three blades did a great job on the cheese, it didn't work well for any of the other ingredients we tried. So I can't advise you to spend $19 on it. Do you have other products you’d like me to try? Email me at SmartShopper@abc15.com .